A Day Late and A Dollar Short: The Disney Store & ShopAtHome - Save 70% on Cars PJs - Only $5! 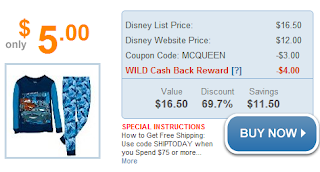 The Disney Store & ShopAtHome - Save 70% on Cars PJs - Only $5! For two more days, you can score this great WILD deal on ShopAtHome. Purchase these Disney Cars PJ Pals for only $5 with **FREE** shipping! You can see from the picture above how this deal works out. BUT, you have to click through their Buy Now blue button link as you see it above. Visit the ShopAtHome website to buy yours today before the deal ends or sells out!